Helicopters do not have a lot going for them. They are expensive to buy as well as operate, somewhat odd-looking, and, if movies like Die Hard 3 and Cliffhanger are reliable sources of information, they can be brought down with a hand gun or a rock or some rope... pretty much anything nearby. Helicopters are fairly vulnerable pieces of hardware, but it takes more than a knock in the rotor to drop them out of the sky. I have traveled by planes, trains and automobiles, but never by helicopter. From an engineering standpoint, they scare me. Where possible, it is good to avoid single-point-failure scenarios. If one airplane engine were to fail, most airplanes can still be flown with the remaining engines. If the main rotor blade of a helicopter were to fail mid-flight, down it goes. The main rotor is responsible for the lift force, and without it, it is time to look for a good parachute (and then a good lawyer). 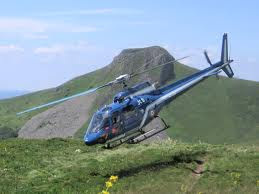 How does a helicopter navigate around? The principal force is generated by the main rotor, which spins very quickly, displacing vast amounts of air in exchange for lift upwards. If it wants to maintain altitude, the lift force upwards must be equal to the weight downwards. Nearly everyone on planet Earth has heard of the organization called NASA. They may not know that NASA stands for National Aeronautics and Space Administration, but they do know that it runs the world’s most successful space program. Though founded in 1958, NASA was immortalized in 1969, when it sent a man to the surface of the moon. The event was the landmark of the twentieth century, and cemented the United States as the world leader in space exploration. The economic benefits that the United States reaped from its lunar landing cannot be overstated. Leaders in aerospace are leaders in technology, and leaders in technology are economic superpowers. If the American energy and auto industries matched the level of excellence of NASA, the United States would be technologically untouchable. I would bet that the vast majority of Canadians haven’t a clue what CSA is. The Canadian Space Agency is the Canadian equivalent of NASA, but the two organizations are hardly equivalent. CSA is a fine organization. They participate in the expensive practice of space exploration on a meagre budget; it is however the level of funding of national space organizations that determines the extent to which they may participate. The expression “sound barrier” refers to the speed of sound in a given medium. In the field of aerospace, which studies motion through air and space, the medium in question is air. Space is a vacuum, which is no medium at all. Sound can only travel if there is a medium to carry its information from one neighbouring molecule to the next. As such, sound does not travel outside our atmosphere, contrary to what silly movies like “Armageddon” would lead one to believe. What is the speed of sound in air? It is dependent on two factors associated with the air itself: its density and its bulk elasticity. For standard atmospheric conditions, the speed of sound in air is about 340 m/s. When an object travels through the air below this speed, its motion is said to be subsonic. The term Mach number (M) refers to the ratio of a vehicle’s speed to the speed of sound of the medium it travels through. A typical commercial airplane may travel around 170 m/s, or M = 0.5. Jets travelling beyond 340 m/s are supersonic. When an aeronautical engineer hears about Mach 4, he or she thinks of supersonic air travel, and not a Gillette razor. About four decades ago, Elton John sang, “Mars ain’t the kind of place to raise your kids ... In fact, it’s cold as hell.” As Mars is the fourth planet from the Sun, this statement remains true today. So, when the first human visitors land there some decades from now, they will probably have left their kids at home on Earth – and they will probably never see them again. I am not predicting that the first manned mission to the planet Mars will fail. I am merely predicting that the first trip to Mars will be a one-way trip. The brave souls who volunteer to take on this expedition will probably do so realizing that their lives will never be the same. No more blue and green Earth. They will most likely live out the remainder of their lives trying to survive on the inhospitable planet, while using any extra available time to establish some kind of home base for future human visitors to make use of. Why will the first Mars settlers never walk among us again? It is for the same reason that sending people to Mars is such a challenging endeavour in the first place: it takes a lot of fuel. If we send the spacecraft with the quantity of fuel it will require to eventually lift off of Mars and return towards Earth, the entire original payload will be simply too heavy. Thus, if a manned mission to Mars is to occur before an alternative method of space travel, such as the space elevator, is implemented, the trip will be one-way. In all likelihood, an adventure to Mars will precede the space elevator’s construction. Therefore, NASA had better start digging through its potential list of candidates, and identify anyone that is qualified to undertake the mission, comfortable with the concept of never returning to Earth, and also mentally sane. The list will be a short one. The distance between the average person and their tools has grown a great deal over the past century. There was a time when the average adult was fairly independent: they could grow and catch their own food, build their shelter, and manage their own health, albeit for their forty-year lifespan. When the tools that were used in society were primitive, it was not difficult to understand how they worked, in a general sense. Today’s tools are not primitive, and they continue to advance exponentially. That being said, aircrafts have been taking flight for over a century. The latter half of the twentieth century saw the friendly skies open up to even middle class passengers. Air transit is now a typical form of transportation. It is normal for a new technology to appear mysterious, even magical, to the common man. However, one would expect the common man to comprehend the basics of a relatively old technology such as aviation. I am fairly positive that more than 80% of the passengers aboard a given flight today haven’t a clue as to how the airplane is flying. Perhaps they feel better chalking airplane travel up to magic. I have news for you: the pilot is not a magician – he or she is just an operator of a well-tuned piece of engineering hardware. There are two main reasons why, for the past sixty years, man has launched rockets from the surface of the Earth. The first reason is to place satellites into an orbit around our planet. The moon is a Celestial body that orbits the Earth in an elliptical fashion at an average of about 380,000 km away from the Earth. Other than this large body and other small space debris that orbit the Earth, all other bodies that do so were placed in their respective orbits by man to serve some purpose. One can think of an orbit as a path that a falling object takes continuously around a larger body. Much in the way that a baseball’s path curves to fall towards the Earth once it is thrown, an orbit is in a perpetual state of falling. The difference is that the orbiting body is moving much faster than the baseball (think kilometres per second), and the baseball faces the resistance of air, whereas the drag forces in space are negligible. It boggles the mind, but we (and when I say we, I mean America and Russia) have transported thousands of satellites into space. Most satellites are used for communication, be it internet, phone, or television, while some are used for Earth observation leading to weather prediction, the tracking of oil spills, and the marvel that is Google Earth. Most satellites are located hundreds of kilometres above the surface of the Earth (note that an airplane’s altitude rarely exceeds 12 km) in an area known as LEO (Low Earth Orbit). Another popular zone is at the GEO (Geosynchronous) altitude of about 35,800 km altitude; this is a special altitude for which the orbital period of a satellite is the same as that of the Earth. If one were to stand on the equator and stare up at an equatorial GEO satellite, one would observe no motion at all. It would be as though the satellite were attached to the Earth by an invisible cord. The typical operational life of a satellite is fifteen years. As such, the majority of satellites currently in orbit are decommissioned and commonly referred to as space junk. The other reason for which man sends payloads to space via rockets is for interplanetary travel. Such ventures are done in the name of research, observation, exploration, and discovery. Sometimes these payloads contain astronauts, as in some trips to the moon, but often these are unmanned missions, or probes, investigating, for example, Mars or Saturn’s moons. The missions are very exciting, sometimes providing answers to important scientific questions, other times demonstrating what we can achieve when we put our minds to it; the 1969 moon landing was perhaps the defining moment, technologically speaking, of the twentieth century. An even more formidable task would be sending man on a return trip to Mars. The greater distance to Mars as well as the greater Martian escape velocity means that the payload leaving the Earth would be much more massive than that for Apollo 11. Also, the trip length (years instead of days) would make the challenge for the astronauts far greater. However, it is the issue of the large mass which makes the Mars mission unrealistic today. Transporting mass away from the Earth using rockets is prohibitively expensive. The cost for satellite placement in GEO is in the area of $10,000 US per kilogram of payload; it is substantially greater for interplanetary travel. In today’s space industry, every gram is questioned. In order for a payload to achieve the escape velocity required for interplanetary travel, over 90% of the mass leaving the Earth must consist of fuel; this is a chemical constraint associated with rocket travel. For this reason and others, the rocket will probably not be the principal mode of travel used to escape the Earth’s gravity fifty years from now. The most promising upgrade from the conventional rocket appears to be the space elevator, which could reduce the cost to GEO to as low as one hundred or even ten dollars per kg (reducing satellite placement costs by at least a factor of one hundred). An operational space elevator, which would carry no fuel, would open up space to mankind; it would bridge the gap between us and the vastness we see when we stare up at night, both figuratively and literally. To kick off “Aerospace Month” on the Engineer’s Pulse, let us first examine what the term aerospace refers to. As the word indicates, aerospace studies the motion of objects through both air (in the Earth’s atmosphere) and space (outside the Earth’s atmosphere). The field of study can therefore be broken down into two principal areas: aeronautical (within the atmosphere) and astronautical (within space). Examples of aeronautical navigation include aircrafts (aviation), helicopters, and even hot-air balloons. Astronautical navigation is limited to spacecrafts and satellites. There is no real line in the sand, where the atmosphere becomes space; there is just a very gradual transition between the two extreme states. Near the surface of the Earth, the medium known as air is a reasonably dense gas, with roughly 1 atm of pressure (101.3 kPa); this figure depicts how tight the molecules of the matter are packed together. In space, at about 300 km altitude, we begin to see the other extreme, where molecules like Oxygen may travel a kilometre before colliding with another molecule.